But first, afternoon tea (sort of). When we had breakfast at Bill’s in Manchester we were given a voucher for a free piece of Victoria sponge or scone if you bought a hot or soft drink, but it was only valid in June, so on Monday after work we met in town and enjoyed some afternoon tea. I chose a scone, which turned out to be two, warm from the oven- lovely. Andy had the cake (which came with a little bit of cream and a pot of fresh strawberries). 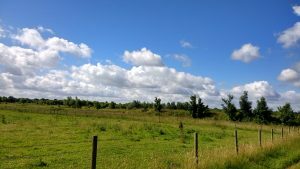 I had driven as it’s on my way home from work, so once we got home we managed a walk before it rained. This week our Tuesday evening club run was speed training. Of course it had been pouring with rain most of the day, so our leader decided to change it slightly. 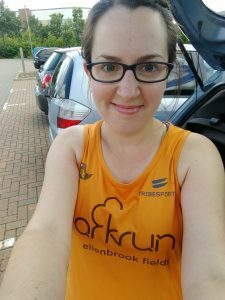 We ran the larger loop of the parkrun course (around 4k I think), and then some of our runners were running 100 miles in June, so they headed off to do some more miles, and a few of us stayed for a bit of speed training. We used the old taxi-way to do various things- a single file game where the person at the back has to run to the front, then we used the gaps in the concrete to run out to the first one, then back, then out to the second one, then back and so on. This was tricky as the floor was slippery in places so the stopping to change direction made it harder. We practised pumping our arms for a bit (which then gave me aches for the next few days) and a bit of core strength balancing. Finally we did a time trial where we ran out for a minute as hard as we could, and then turned around and tried to get back before the next minute was up. We then did this for 30 and 15 seconds. I think I managed it once! Need to work on the pacing! Again the turning was hard- we had been warned to be careful but I was being very cautious as I didn’t want to fall. It was dry for most of it, but near the end it started to pour and I had left my tennis visor in my car. Whoops. I struggled to get my jumper on over my soaking wet skin and clothes, and then realised as I was half way home that my watch was still on. Whoops again! I did manage to edit it later in Strava, and delete the last bit, otherwise it looked like extremely speedy speed training! 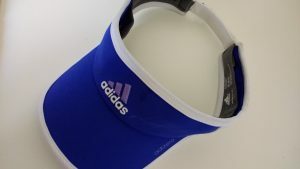 And if you listen to this week’s marathon talk you can hear a little discussion about tennis visors- honestly those guys don’t understand how annoying rain is when you wear glasses! (I feel I need to email this to them because it’s not a green plastic thing, it’s nice). In support of Canada day (or just a coincidence) I bought a lot of Pip and Nut peanut butter- EarthMiles had an offer for 15% off (you earn earth miles by linking up to Strava or Garmin etc- activities earn miles to be exchanged for deals on various health and fitness products), and they had some limited edition crunchy pb with maple syrup. It is pretty amazing. I also got some of the normal peanut butter, and a little mixed mini case with three types (I think maple, coconut and almond, and one other)- I shan’t be running out of peanut butter for a while. I normally run after work on a Wednesday, but my arms were aching and it was raining, so I decided to have a walk instead, and enjoy spending a bit more time at home- I feel like I hardly sit on my sofa at the moment. I had also started thinking about the 100 mile challenge, as some of the girls had already signed up to run it in July. So resting before that started would be a good idea. On Thursday I was off to Pump- our instructor was away so they had a replacement, who does a lot of the 30 minute pump classes. She was a bit scary at first- we asked her if it was the new or old release, and she told us that our instructor should not be doing the same release each week, but changing it all of the time. This made me nervous as I had only been once since falling over, and I got a gauge for the weights I should be using, but as soon as it is something new I tend to go for lighter weights to see how I am, as I can add more the following week. So I was fairly conservative in the end. It was still good, and the instructor was encouraging, but I really prefer to do the same one for a while so I get the hang of it. On Friday I decided to sign up for the 100 mile challenge (here if anyone is interested). I figured that as I finish for the summer holidays on the 22nd, I will have a week to catch up any mileage if I get behind. I do have a few races coming up, and I can always add a mile or so on to a parkrun to get the distance up too. So when I got home I headed out on a run (later than planned because I had not used the Bluetooth headphones with my new phone, so I then had to find the box, do the activation code, pair them together…). Anyway, the run was fab- nice and sunny but a breeze so I wasn’t too warm. I did some stretching in the garden when I got home too (also I noticed that my nails matched my shoes). It is so lovely to be able to cool down outside in the privacy of our back garden. 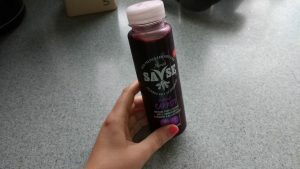 I have been sent some Savse smoothies to sample, so I had one of them after- this one was made with purple carrots, plus berries and it was lovely (I will do a proper review later). 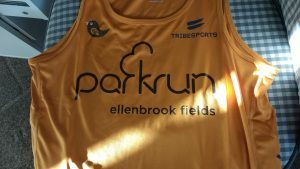 My personalised vest also arrived on Friday- perfect timing as I was down to tail run and do the new runner briefing at Ellenbrook. (I have a Panshanger t-shirt, so I thought it was only fair to get an Ellenbrook vest- I had to wait about a month though). It’s a perfect fit- nice a long, and loose- it is a small but they are generous, like the milestone t’s are. Because of signing up for the 100 miles in July, I decided to get to parkrun early and do a mile or so before it started. I passed a few of the people setting up who looked a bit confused to see me going the other way! I think I ran about 1.6 miles before going to get my high viz vest and tail runner lanyard. I had to shout to attract the new runners as the RD was positioned at the entrance to the field and not at the start, and I had a big group of people (37 first timers listed on the results), and it was windy so I felt I had to use my best teacher voice! 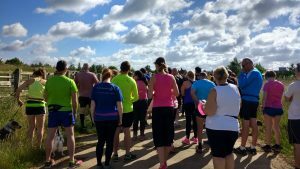 I am so glad I plucked up the courage to do the new run briefing last year at Panhanger, because it is really enjoyable to welcome brand new parkrunners, and interesting to see where the tourists come from. 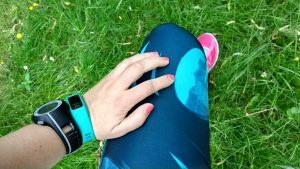 I had a few late comers asking about barcodes- I think when I first went I imagined I had to run through the finish tunnel waving my barcode, so I can sympathise with how it is hard to understand how it might work. My tail runner view of the start. Then it was time for me to switch roles and stay at the back to tail run. I wanted to do this as I have a 10k race tomorrow, so didn’t want to be tempted to push myself, and I’m doing the same next weekend too, as it’s the 10 miler next Sunday. I ended up walking around, accompanying a lady who had been to a couple of parkruns before, and had been doing a new to running group at a local running club. It was lovely to chat with her, and enjoy the beautiful scenery. As we came up to the finish, one of our club members shouted for her name, and then all of the people at the finish gave her a big cheer as she crossed the line- it was great to see. I quickly got my chip scanned, and then jogged back to my car- my watch beeped for 5 miles on the way- only 91 to go! I was very pleased with my new top! I might even get another vest as I much prefer running in vests to t-shirts. I then rushed home for a quick shower and breakfast before going to school, as I was manning a stall at the summer fair. I bought some plants on the way home, so after a late lunch and a walk into town, I spent some time outside doing some weeding, and planting a few flowers (poppies, foxgloves and cornflowers) to add some colour to our garden. I also got scratched by a very evil rose bush. Would you be tempted by a distance challenge? I know a lot of people like run streaking, but I know it is not good for me to run every day. I did the poppy challenge last year (run as far as you can in October) and that was good as it encouraged me to go out for maybe a bit longer, but without being silly. If you volunteer at parkun/ races, what is your favourite role? 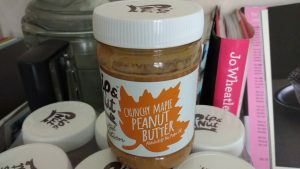 Ooooh just to let you know, if you sign up to Pip’n’Nut they do have some pretty cheap offers – I got 3 jars for £8!!! (love a bargain!). I used to set myself monthly running challenges, for example a certain amount of miles a month (it was normally around 100) and I do feel like I need to try that again, maybe more modestly but to get my mileage back up again. Thanks- I shall check my emails as I ordered direct from them so hopefully will be sent offers from now on! All the 30 minute pump classes are before work, but too late for me to get home and then to work, so I have to stick to the hour one. I think they miss different tracks each week, but I don’t really know. Good luck with the running challenge. You’ve totally reminded me to check out the deals on Earth miles again, I always mean to but forget! It pops up on my phone every now and then- I then get all the vouchers but don’t always use them! Previous Previous post: Rain rain go away! Next Next post: WR10K 2016- my, that was hot!